Search engines are improving search results for mobile devices such as smartphones and tablets. Mobile users are most likely to view a site with adaptive design, dynamic page layout or a mobile version of the site. The site adapts to the screen size and resolution. It is available at the same URL for all devices. For viewing the site on different mobile devices, the server responds to the URL request with different versions of the HTML and CSS code. For viewing the site from mobile devices, a separate URL is used (a subdomain, such as m.example.com, mob.example.com, and so on). The recommendations for webmasters below are relevant for all approaches to site adaptation. Site pages must respond to the server with the 200 OK HTTP code. You can check the server response in Yandex.Webmaster. Don't use Flash, Silverlight, or Applet technologies on pages that are intended for mobile users. These technologies aren't necessarily supported on mobile devices. Tip. For example, users can't view an interactive section of the site or videos implemented using Flash. We recommend using HTML5 to integrate content, or eliminating heavy and complex interactive elements. 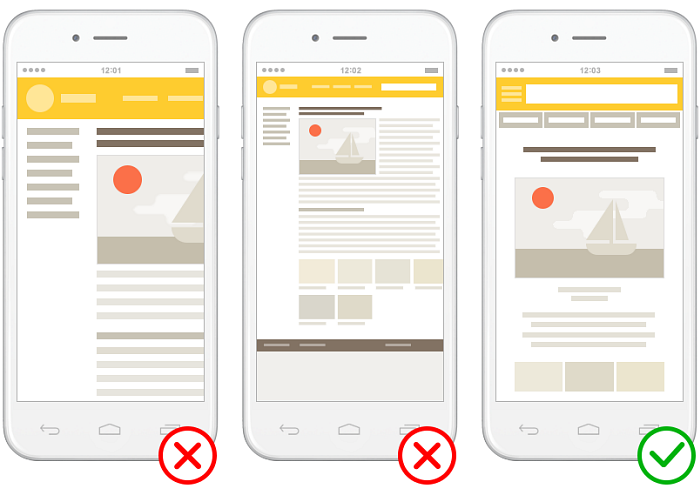 Make your site's content maximally visible on a mobile device screen. The site content should fit on the screen horizontally. The text size in pixels should allow the entire text to be read comfortably on a mobile device screen. Check how well the site is adapted for mobile devices in the Tools → Audit pages for mobile compatibility section in Yandex.Webmaster. Can the content of the mobile site version differ from the main version? You can optimize the content of the site pages for mobile search. For example, you can leave only the content that will be useful for the users of mobile devices. At the same time, the mobile pages' content shouldn't be dramatically different from the content of the main version. How can I avoid duplicate content? Yandex treats the main version and the mobile version of the site as separate sites and indexes them separately from each other. Do I need to set redirects to the mobile version of the site? You can redirect the user from the main site to the mobile version, depending on the user agent of the device from which the user browses the site. Do I need to add a mobile version of the site (domain or subdomain) to Yandex.Webmaster? You can add a mobile version of the site to Yandex.Webmaster to track the page indexing statistics. Can I create a mobile version of the site in a subdirectory (folder)? If the mobile version of the site is located in the main site directory, the Yandex indexing robot can't index it correctly. We recommend that you create a mobile version in a separate domain or in the subdomain of the main site. How do I tell the Yandex robot that the adaptive site version is available? For sites with adaptive design, use the <meta name="viewport" content="width=device-width, initial-scale=1"> meta tag to specify the viewport. For more information, see the Using HTML tags section.